Pat Lipsky started her career in the early 1970s, showing evocative gestural abstractions at André Emmerich Gallery. After a lull in the 1980s, she resurfaced on the gallery scene in the early years of this decade, her work now consisting of gridded, monochrome lozenges brushed onto diamond-shaped canvases. In her recent show, Lipsky presented four paintings and as many works on paper, all done in 1998-99, that quietly reminded us of the possibilities inherent in the formalist idiom of geometric abstraction. These new, rectangular canvases show rectangles nestled in a loose grid of verticals and horizontals. The artist has abandoned the strict (if lush) monochromy of her work of the earlier ’90s for a muted but varied palette of greens, grays, blacks, purples, pale pinks, blues and occasional reds. The relative regularity of those earlier grids has been thrown out in favor of a more complex interaction of interlocking shapes. 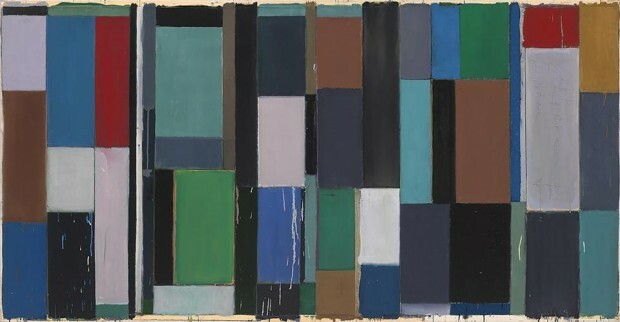 Are you here?, one of the standout paintings in the show, consists of differently proportioned rectangles and squares vertically stacked to create a dynamic composition. This dynamism (which suggests the movement and activity of the urban landscape, not unlike Leger’s cityscapes or Mondrian’s New York paintings) is heightened by the flickering quality of color: Lipsky uses a pink-red underpainting that peeks out between the elements, themselves the product of a dense layering of hues. The inclusion of works on paper in the show seems to suggest that Lipsky’s paintings are the result of meticulous planning; One Year II, for example, is a fairly worked-out study for Are you here? But the paintings reveal spontaneity, too, a sort of intuitive, action-reaction method of decision making, especially where color is concerned. Her practice of layering color creates delicious visual paradoxes: in Sea Breezes, kelly green paint drips down from a square subsequently overpainted completely with gray-violet. Drips and splotches abound, as do other signs of studio messiness. A sort of sensual, textural variety is produced by Lipsky’s mixing mediums—acrylic, egg tempera and alkyd—on the same canvas. The surfaces are punctuated by strips of masking tape, a means of making hard edges, but instead of peeling the tape away to reveal a clean edge, she leaves it in place, adding one more element to the mix. If these works occasionally seem a little too tasteful—as in the lovely First One, whose palette may fairly be described as “Calvin Kleinish”—more often than not they achieve a compositional rigor that speaks to the virtues of late modernism. Today, as young artists look back with renewed interest to that period, Lipsky has the advantage of being an original.